It was an early start to the season with a number of riders taking to the start line at Croft in January for the Velo29 Winter series. A number of riders including Josh Jones, Ben Orpin and Joe Jackson all taking early season points in their relative categories. The early racing continued now across at Middlesbrough Cycle Village with the Prissick Spring Shield which saw Joe Jackson podium in the 2nd round and gaining his Cat 3 license and Adam Jarps taking two top ten finishes and Josh Guest obtaining his Cat 3 licence. April saw the start of the Road and TT races, with a number of riders taking to the start line in local club TT’s and also stepping up to take on local road races. Adam Jarps showing his quick pace on the TT bike with a superb early season podium in the Cleveland Wheelers SPOCO event with a 3rd overall and 1st Junior and setting constantly fast times at the Ferryhill Hill club 10’s and improving on his PB from 2016 early in the season. Adam eventually winning the Ferryhill Wheelers club 10 overall handicap prize. Josh Jones continuing his strong start to the season with a number of excellent results during May including finishing 14th overall in the infamous Ilkley 2 day, then taking his first podium top spot less than a week later and winning the Lincoln Criterium before taking his second 1st place finish a week later on the York circuit in the York Cycleworks Spring circuit series. May also saw Adam Jarps continuing his form on his TT bike with a 3rd place overall and 1st Junior in the Hartlepool open 10 TT. 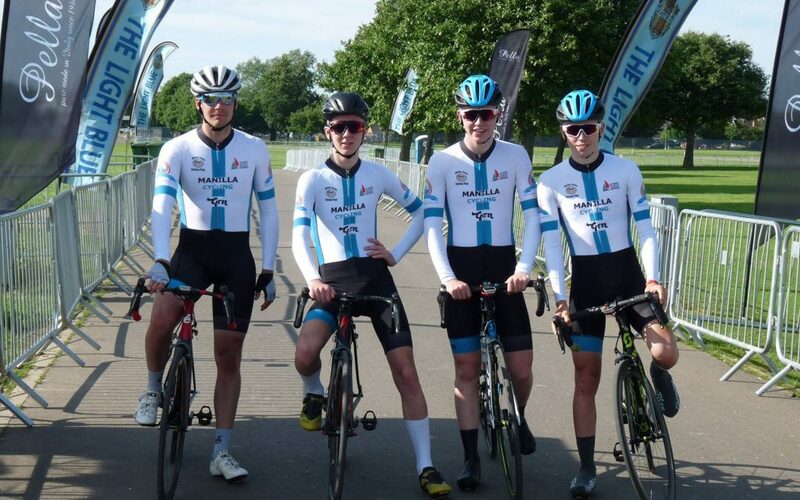 June saw a number of superb team and individual results starting with the UCI Tour of Cambridge Team TT event were the team of Craig Carruthers, Josh Jones, Bevan Jones and Adam Jarps finished 4th overall from over 60 teams and less than 10 seconds of a podium. Two weeks later Josh Jones, Bevan Jones and Adam Jarps took to the start line in the National Team Time Trial, on one of the hottest days of the year and with a strong line up including many previous champions on both road and TT’s saw the team finish a superb 20th overall and the youngest overall team in the competition. Josh also continuing his form out on the road saw a superb 2nd place finish in the Peter Taylor Memorial road race. Continuing the success into July saw Bevan Jones take his first win on the new City RC Hull – Ennerdale Cycle Circuit in the Launch Race Evening. Adam Jarps also winning the Durham and Northumberland regional 10 and 25 mile Junior champs and winning the Junior categories in the Blaydon and Sunderland Clarion TT’s with top five overall finishes in both and securing the Durham and Northumberland BAR trophy. With a focus shifting to TT both Adam and Bevan took to the start line on the infamous Hull V718 course on a warm Saturday afternoon with a strong start line which saw Adam take the Junior win with a new PB of 19:18 and Bevan only two seconds behind in second place and also setting a new PB of 19:20. Both times securing them top 5 junior times of 2017. Bevan and Josh Jones then taking to the starting blocks in the National CTT 25 mile champs saw both riders with excellent performances in extreme weather conditions. Adam Jarps travelled down to Dorset in early September to compete in the TLI National TT Championships were he took the Junior title and his 1st National jersey. Moving to the CTT National 10 mile Championships mid-September Adam finished 10th overall, and now was targeting the National Closed Circuit Championships and hill climbs in October. Hill climb season saw Adam take on both the Cleveland Wheelers Clay Bank and Stockton Wheelers Carlton Bank climbs early October with Adam taking overall first place in both events and the overall combined prize. Josh and Bevan also taking first and second respectively in their local hill climb. Two weeks later Adam again took first overall prize in the Ferryhill Wheelers hill climb in Stanhope before finishing a superb fifth Junior in the National Hill Climb held in Northumberland. October also saw the last TT of the season with Adam competing in the CTT National Closed Circuit Championships in Thruxton were Adam took 2nd Junior and 18th overall from over 200 riders. 2017 has been great year with a number of excellent team and individual performances and which we will continue to push to improve on further in 2018.